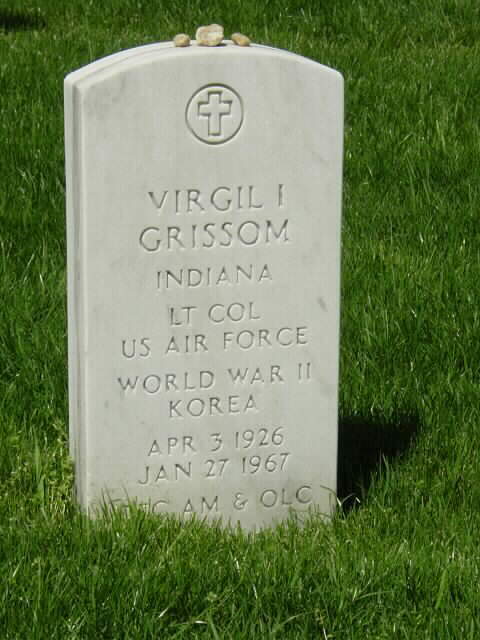 Born April 3, 1926, Virgil I. Grissom joined the United States Air Force in 1950 after graduating from Purdue University. He served as a fighter pilot in the 334th Interceptor Squadron during the Korean War, flying over 100 missions and earning the Distinguished Flying Cross. In 1956, he graduated from the U.S. Air Force Test Pilot School, Edwards Air Force Base, California, and was subsequently one of the original Mercury Astronauts selected. He was killed with Roger B. Chaffee and Edward White on January 27, 1967 at Cape Kennedy, Florida, during the testing of the Apollo I rocket. The flight was scheduled for February 21, 1967 and was to have been the beginning of U.S. efforts to put a man on the moon. A fire broke out in the cockpit and before they could be rescued all were killed. 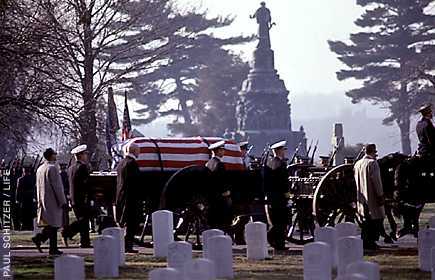 He was buried in Section 3 of Arlington National Cemetery, beside Roger Chaffee and just a short distance away from the first military air casualty, Thomas E. Selfridge. INDIANAPOLIS, Indiana - Betty Grissom knows what it's like to lose a loved one in the space program. 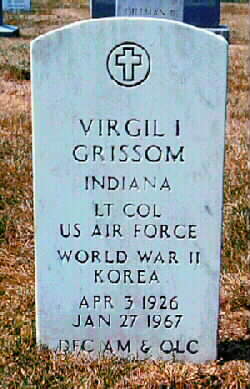 On January 27, 1967, her husband, Indiana native Virgil I. 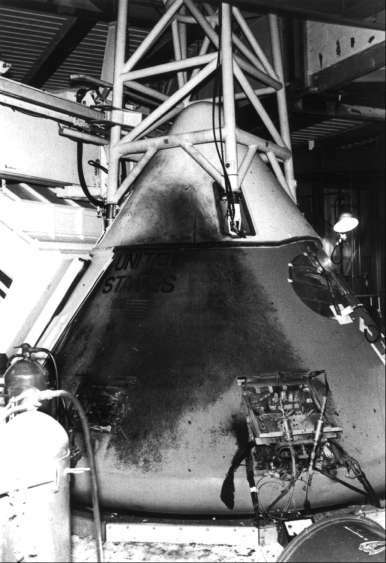 "Gus" Grissom, and two crewmates were killed when a fire swept through their command module as they trained for what would have been the first Apollo mission. But unlike those who grieve for loved ones lost in Saturday's explosion of the space shuttle Columbia, the Grissom family was not embraced by the nation. In 1967, there was no comforting phone call from President Lyndon B. Johnson. No offers of counseling. No financial support. "I've waited 35 years for somebody to come by my home and explain to me about the Apollo 1 fire," Grissom said. "I'm still waiting." 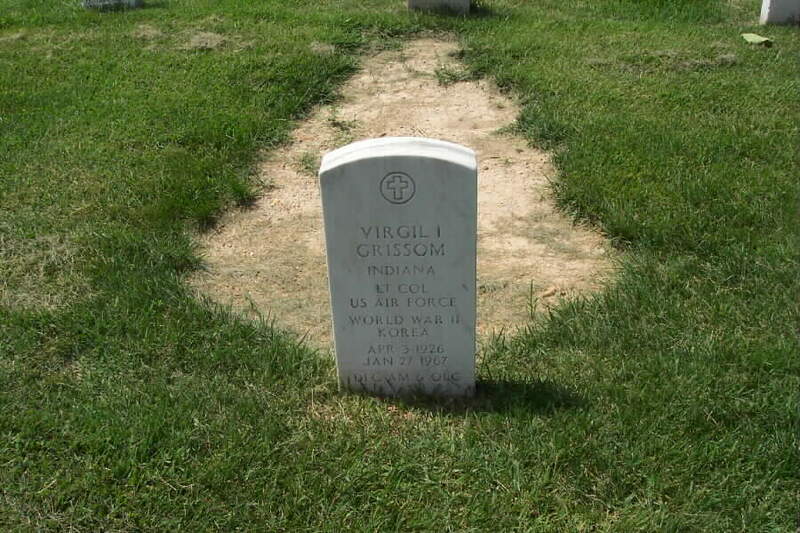 Almost from the moment the family left Arlington National Cemetery, where Grissom is buried, "we were cut off," his widow said. "I never heard from anybody." Her sons Scott and Mark, who were teenagers at the time of the fire, followed in their father's footsteps to Purdue University and both became pilots. But it took a lawsuit against NASA to get the money that paid those bills. Grissom received a $350,000 settlement, 40 percent of which went to attorneys. NASA's attitude, Grissom said, was to talk as little as possible about the disaster, in hopes the public would just forget about it. Officials even stopped referring to her husband's mission by its rightful name, Apollo 1, and called it "204" instead. "It's because if you say 204, nobody knows what you're talking about." It hurts Grissom and her sons that Apollo 1 is so forgotten. Last week, they held a memorial service at Pad 34 at the Kennedy Space Center in Florida, the place where Grissom and fellow astronauts Edward White and Roger Chaffee died. It went unnoticed by almost everyone, including the media. 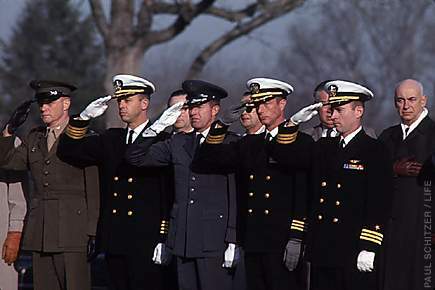 A final salute at the funeral of Astronaut "Gus" Grissom, by his comrades, from left to right, Colonel John Glenn, US Marine Corps, Captain Alan Shepherd, US Navy, Colonel Gordon Cooper, US Air Force, Commander Scott Carpenter, US Navy, and Commander John Young, US Navy. 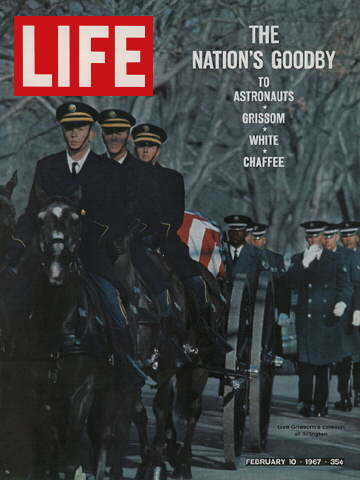 Marching with Grissom's casket, are (from left) Christopher Kraft, NASA Director of Flight Operations; Young; Robert Gilruth, Director of the Manned Spacecraft Center; Carpenter; Glenn (beyond casket); Shepard; and Deke Slayton (in civilian clothes), now a NASA official. 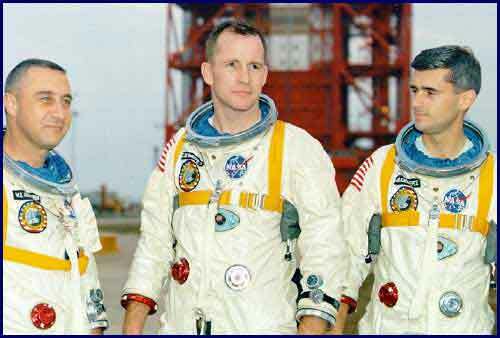 All astronauts except Young, Grissom's partner on Gemini 3, were in the original Mercury program.